This phrase, which translates as “May you travel in peace” is what I ask each of you to wish me on Wednesday, April 14th of this year 2010. That date is the answer to the question many of you have asked over these past two years– a question that I’ve often asked myself. That is the date of my departure for Tanzania! 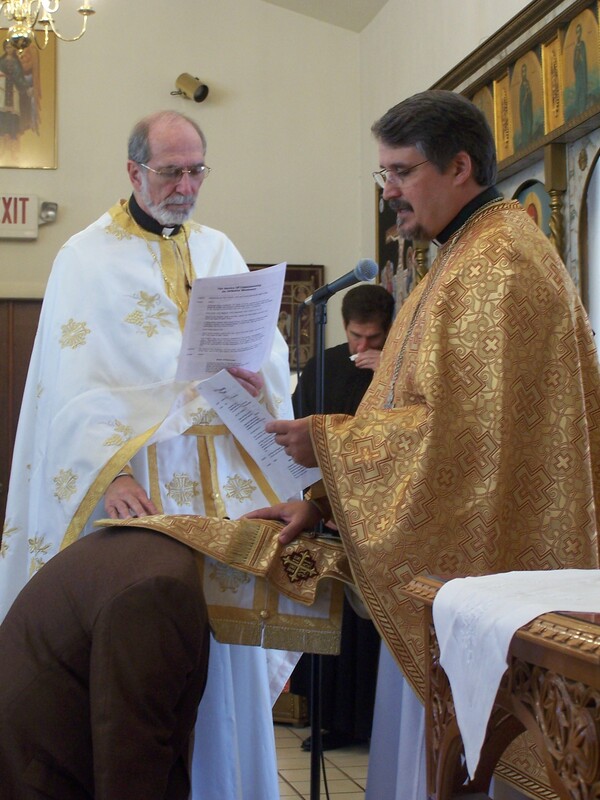 Exactly one month before departure, on Sunday March 14th, I was commissioned to serve as a long-term OCMC missionary at my home parish of St Elizabeth Greek Orthodox Church in Gainesville, Florida. I was commissioned by my priest, Father Nikitas Theodosion, as well as Father David Rucker of the Orthodox Christian Mission Center. As a PS to this email I’ll reflect a little on the prayers of commissioning, and on what this new stage in my life will mean. April 4th: I celebrated the Resurrection of Christ with the faithful of St. Elizabeth Greek Orthodox Church at home in Gainesville. May 3rd: Language school begins in Dar es Salaam, on Tanzania’s east coast. July: By this time, if God wills, missionaries Felice Stewart and Katie Wilcoxson may join me in Dar es Salaam. They hope to start beginning language courses as I continue my Swahili study at an intermediate level. August: I hope to finish advanced-level Swahili courses by the end of this month as missionary Michael Pagedas (and possibly Maria Roeber) join Katie and Felice in language school. As my colleagues continue language study, God willing I will be able to move to Mwanza and begin my assignment with the local Church there. There is much more than this to say, and I’ll say more in the PS. God is good. By your prayers and faithfulness, I’m on track to receive all the financial support necessary to keep me on the field long-term. Most of this comes from a team of about fifty supporters, each giving roughly $50 monthly through 2012. A few supporters are giving a little more, and many are giving $10 – $15 per month. It is humbling and exciting to watch God multiply these offerings as He did the loaves and fishes to provide for his servants. Thank you for your participation in this work. Please stay in touch. I look forward to reporting from the field shortly! O God, our God, Who Sent Your only-begotten Son for our salvation, and at His bidding gave to His disciples the Holy Spirit, send down Your Holy Spirit upon this your servant James and commission him for this present ministry of proclaiming Your Good News and sharing Your love. Travel with him as You traveled with Your servant Joseph and deliver him from all agitation and slander and all devices of the evil one. Keep him strong in body and soul so that he may be light to those still in darkness. And grant that he may fulfill in all righteousness Your command to go and make disciples of all nations, baptizing them in the name of the Father and of the Son and of the Holy Spirit and teaching them to observe all that You have commanded. May his service be pleasing in Your sight that he may praise and glorify Your most Holy and magnificent Name, of the Father and of the Son and of the Holy Spirit, now and forevermore. This is also the assignment that was given to the faithful present at my commissioning, and it is what I ask each of you to join in as you are able. Over the past year, I have met many of you face-to-face, and bear witness to the great love and faith that you practice in your parishes and communities throughout North America. As I bear witness to the glory of God being proclaimed here on American soil, I am able to carry to Africa this message and faith that God has shown me through you. It is by your prayers, friendship, encouragement and material support that I am sent to participate in the apostolic work of the Orthodox Church in Tanzania. In a very real way, my assignment is only to be a vehicle of your love and faith, faithfully transmitting to Africa what you have given me here. As I learn to participate locally in God’s glory, it is each of you who will be proclaiming the glory of God in Mwanza and throughout Tanzania. So I ask for your continued involvement in this work. Please keep giving. Please keep writing. Please keep calling (I’ll have Skype). Keep me accountable. And most of all, please keep me before the face of God in your holy prayers. Through your prayers, I have already been borne along over the past year. God’s grace has been abundant. The challenges of adjusting to a new language and culture in this next year will call for a continued abundance of that grace. Please also be patient. In order to meaningfully participate in the life of the Church, I have to listen to people. In order to listen to people, I have to learn their language and their culture. This takes years. The very first line in my job description states that my “primary responsibility the first year will be language acquisition and enculturation.” And a year is just the tip of the iceberg. So you won’t be hearing dramatic stories of my impact on Tanzania any time soon. You might just hear some stories about Tanzania’s impact on me. By your prayers and if God wills, in the next five to ten years I should have begun to learn the language and culture well enough to play a role in what might be called “meaningful results.” This vocation as a missionary is a long-term commitment, and I’m grateful for your patience and friendship as the process begins. May God bless you and all you meet! Tanzania is a place I’ve always wanted to visit, but never have. Thank you, Father Deacon. Your scholarly work regarding the Orthodox Church here and elsewhere in East Africa has been a great help to me.